Faced with a ravaging drought and acute food shortage, the government of Zimbabwe has decided to put its wildlife up for sale. However, the announcement by the Parks and Wildlife Management Authority does not specify when the sale would begin, which animals are to be “destocked” at what prices. Environment, Water and Climate Minster Oppah Muchinguri-Kashiri was quoted as saying in media reports, "The government is planning to use the money to buy food and secure water facilities for distressed animals after the severe drought has destroyed crops and livestock." Zimbabwe has been hit by an El Niño-induced drought leaving more than four million people in the need of food-aid. The African nation has appealed for US $1.6 billion in aid to help pay for grain and other food, reported Reuters. The Zimbabwe government claims that it needs to take this emergency step as cash flow in the country is highly deficient. Exports of maize and tobacco have fallen, and the European Union’s ban on trophy hunting imports has deprived the country of additional income. An official from the ministry of Environment, Water and Climate also said that impact of the drought had to be tackled head-on for the survival of most wild animals. He added that the country’s animals are at risk of dying due to the drought and a solution needs to be found. 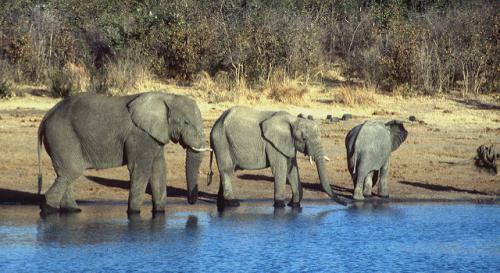 Last year, the Zimbabwe government faced scrutiny for selling elephants to China. The sale, government officials admitted, would reduce the booming elephant population but also raise money so the country could buy things like anti-poaching and surveillance technology.